How to work & record in MS ? What is MS (Mid Side) and how to encode/decode this signals ? Record in MS... why not! Heard some about it... but what's this ? MS technique is a stereo recording technique invented and patented by Alan Blumlein in 1934. 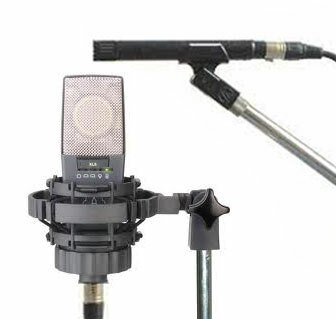 Recording is made by using two microphones ; a cardioid pattern (mid) and a figure-eight pattern or bidirectionnal (side). Theorically all diaphragms must be coincident and penpendicular for a perfect phase response. This means that in practice, you'll try to set your pair of microphones as close as possible on the same vertical plan so that they are at the same distance from the sound source. Your cardioid microphone should face your sound source whereas your figure-eight pattern microphone is set perpendicularly to it. AKG414 set to figure 8 pattern with and a Audio Technica 4051 as cardioid. where "-R" is just the polarity-reversed R signal. where "-Side" is just the polarity-reversed Side signal and /2 means that you have to lower the gain of 6dB to retrieve the original signal (and not the same signal doubled). As you can see, if you sum Left and Right you only get the Mid signal. This configuration produces a completely mono-compatible signal. When you record Mid & Side separately, you can manipulate the Mono and the Stereo part of the signal independantely that means eq / comp / gain (anything you want) which can completely change & improve the original sound. As the stereo width can be manipulated as you need, this makes it very useful for film as well as musical projects especially in mastering sessions, but also for guitar or choirs recording. How convert a stereo signal into MS and then back to L/R ? As we've just seen, a simple matrix produces Left and Right from a recorded MS, so how do you go from a L/R stereo signal to MS then to L/R ? let's see what you can do with your DAW. 1 - Route your stereo source to 2 mono busses, for example bus 1 & bus 2. 2 - Create 2 stereo aux tracks and name them M and S.
4 - Insert a stereo plug-in that is allows you to reverse the polarity one of the channels, any EQ or compressor plug-in that allows a polarity change will work fine, however be sure you insert the same plug-in on both M and S tracks otherwise the latency between the plug-ins might be different and may induce an annoying phasing problem. 5 – To create the M track, leave both sides of the plug-in in phase and output to bus 3. 6 – To create the S track put the right channel out of phase (reverse polarity) of the plug-in and output to bus 4. 7 – Don't forget to reduce the level of both M and S signals by 6 dB so that the output is not doubled. Now how do we get back to L/R signal ? 2 - Set the inputs for both stereo Aux tracks to bus 3 and 4. 3 – Name the first Aux Left and the second Aux Right. 5 - Reverse the phase of the right side of the plug-in on the Right channel. 6 – Route these channels to another stereo Aux track to have your final track on one track and not split onto 2 tracks (set inputs on stereo bus 5/6 and name this Aux track L/R). When you're done, you can try reducing / increasing the M and S channels and hear the effect of "stereoizing" or "monoing" the signal. You can also try to insert some plugins on both M and S tracks and see what's happening. To keep the same latency on both tracks, just bypass the plugin you don't use. If you want to use good ready made plugins, you should try the Brainworx, Flux or Izotope. A nice article from Universal Audio. Go from Work & record in MS to Audio Technique?